We are the prominent manufacturer and supplier of Generator Equipment Container Enclosure. Our product range also comprises Aluminum Lined Container, Office Container and Cabin. These products are precisely manufactured under the supervision of experienced professionals using premium quality raw material and sophisticated technology. Entire range is tested on well-defined parameters of quality in order to offer a perfect range of products at client's end. 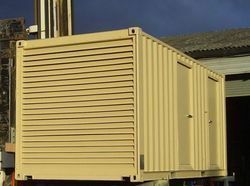 We are the renowned manufacturer and supplier of an exclusive range of Generator Equipment Container Enclosure. Our offered product is extensively used in various industrial sectors for keeping generators. This container is precisely manufactured using supreme grade factor inputs under the strict supervision of our quality experts. To meet the diverse requirements of our esteemed clients, we offer containers in numerous specifications and dimensions.